So you saw my pamper hamper ideas that I uploaded on Friday, this is my second ideas guide and it’s a luxury Christmas one. I did originally plan to do three but it didn’t end up working out as I’d planned so two will have to do! I didn’t do gift guides last year but I wanted to find a way to do something of the sort this year. My mum is an avid hamper fan, she puts together multiple hampers every year so I thought it was a perfect opportunity to see how good I was at creating my own. Obviously as stated, some of these gifts are rather extravagant and it’s reflected in the price. These are ideas for a main feature in a luxury Christmas hamper depending on your budget or even as singular presents for a loved one. I am incredibly in love with this watch and will be gifting it to my lovely boyfriend for Christmas so I hope he loves it just as much as I do. I’m really hoping he isn’t looking at this blog post otherwise I’ve ruined the surprise… This baby is the “THEY Grande Black & Rose Gold” Adexe watch, it’s unisex and currently retails at £129. The price does reflect the luxury nature of the product but I think everyone should own a fancy watch at some point. It’s such a stylish and professional outfit addition aswell as being practical, of course. I think we’re going to be a pretty swanky couple when I’m also sporting my Rose Gold Adexe. If you fancy grabbing one for yourself or a loved one this Christmas, you can also use BLACKTULIP15 to get yourself 15% off of your order! I don’t know about you guys but I absolutely love how cute minis are and that counts for pretty much everything. Mini beauty products, mini beverages, mini versions of food (which is why I love afternoon tea). This fabulous set is from Findagift.co.uk and is choc-full of them with 4 miniature big branded gins, a miniature prosecco, 3 miniature sodas and 2 miniature cordials. It also comes with some guides that help you with creating some scrumptious cocktail combinations or you can just make your own! A personalised item is always a good touch and Jackson Trophies provide engraving on many gorgeous items such as drinking glasses, vases, watches, keyrings and all sorts of trophies. They can also do corporate orders if you’re looking to say thank you to a team of people! They pride themselves on their great quality, prices, delivery and customer service and are a brilliant way to show someone that you wanted to give them something personal. As it’s a pint glass, I’ll be popping this particular one into a beer hamper! Who doesn’t love a good luxury food item? I’ve gone for chocolate as it’s definitely one of my favourite gifts to receive. These are a box of Swiss truffles from M&S and they are so incredibly creamy. They remind me a bit of Lindt and are often on a really good offer on the lead up to the festive season, too! You could go for any sort of luxury Christmas food item really like cheese and chutneys, some posh crisps or maybe some shortbread or fancy cookies. I absolutely love the idea of this keyring. I think it’s such an adorable, thoughtful and luxury Christmas gift for a loved one for such an affordable price. The particles in the keyring are actually pieces of meteorite NWA 869 that obviously came from outer space and travelled millions of miles to reach Earth. 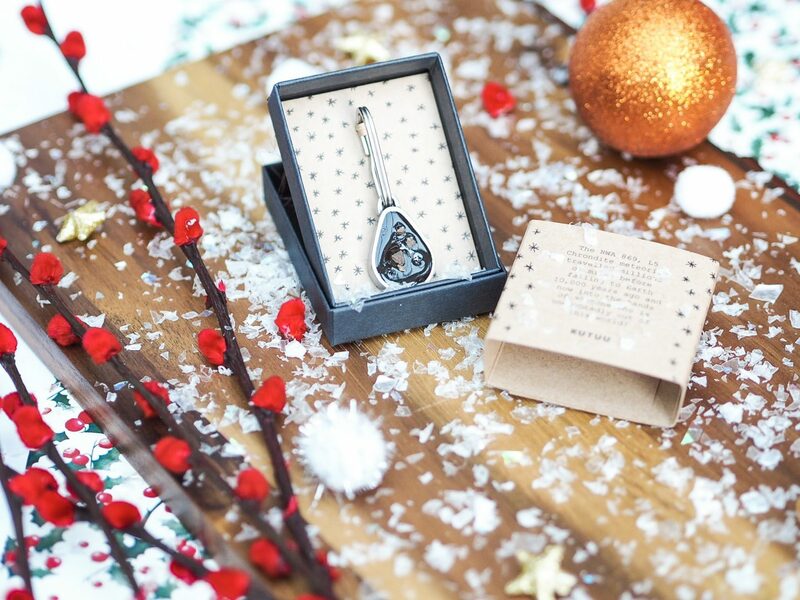 The meaning behind this is to say that the person you are gifting it to is “out of this world” which is also engraved on the back, how cute! They’re also all handmade, completely unique and come in perfect little gift box. You can grab one and many other incredible items for yourself over on the Taylor And Belle site here. They’re a fabulous small and independent business who definitely deserve your money this Christmas. BOOKS. Books are always a brilliant luxury item, especially a series of incredibly intriguing ones like these. 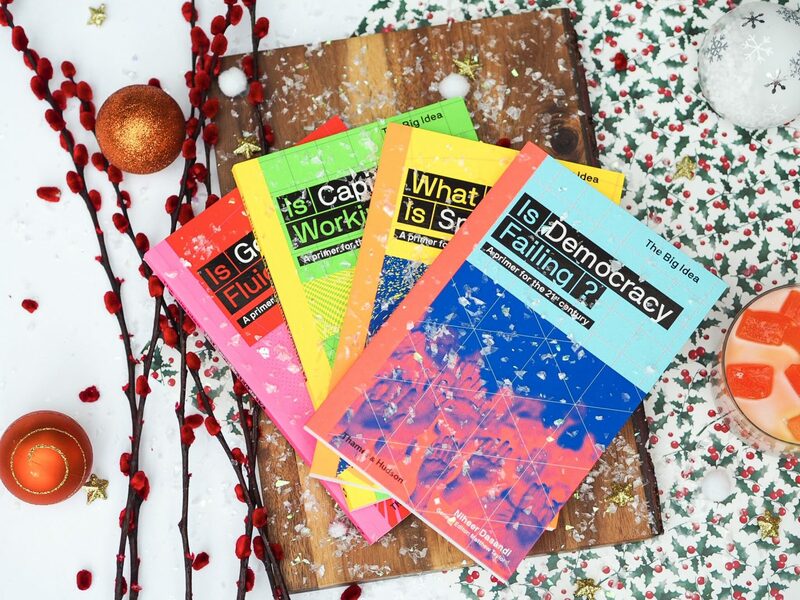 Discussing a range of controversial topics from capitalism to gender, The Big Idea series claims to bridge the gap between fact-based knowledge and opinion. With young, expert and highly knowledgeable authors, in-depth introductions and illustrations that only add value, these books are bound to hook any reader interested in educating themselves on these topics aswell as striking up an internal debate. Also helping to continue forming their own opinion on the subjects and more specific issues discussed. You can find out a bit more about them and where to purchase them on the Thames and Hudson website here! What would be your dream luxury Christmas gift this year? "Ideas For A Christmas Pamper Hamper!" "Changing My Look With Comfi Color 1 Day Lenses! 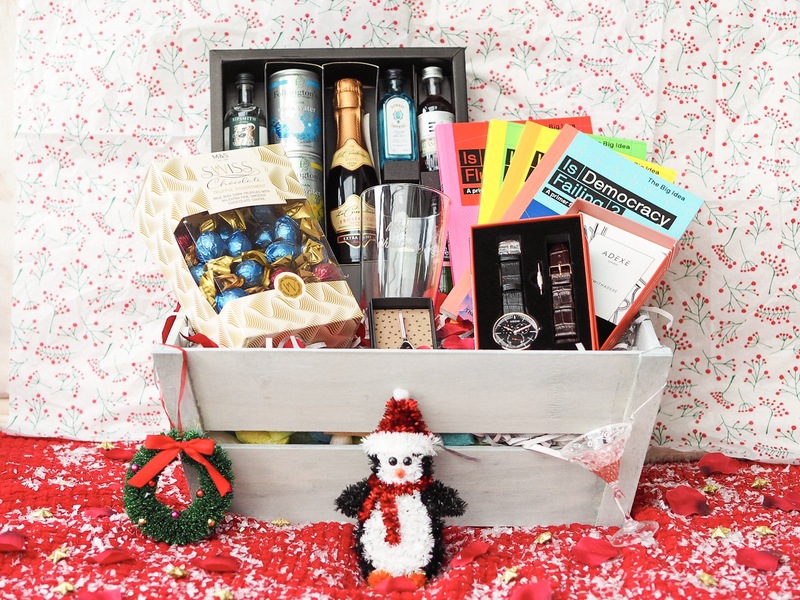 AD*"
I love making up Christmas hampers as I think you can create such a personalized gift! The watch is gorgeous, I hope he loves it. 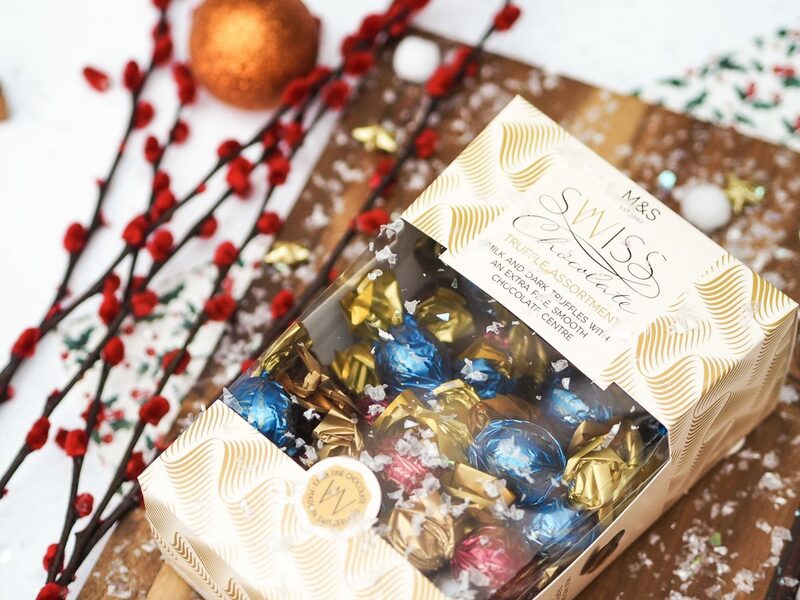 Those M&S chocolates look and sound amazing too, I’ll definitely be picking some up but probably for myself! Oooh that keyring I might have to buy! That is amazing! Ooooh that gin fizz and prosecco box sounds like a dream and what a brilliant idea! I’d love to receive that! An ADEXE watch is always a good idea, they are so gorgeous! Great ideas! And I have had those M&S chocolates before – they are delicious! Really like idea of the Gin Fizz and Prosecco MicroBarBox! Your images are so christmassy! Thanks for sharing, I love creating Christmas hampers! I love these gifts! That watch is very beautiful, and you can never ever go wrong with books and chocolate. My luxury gift would definitely be books. I seem to always just wish for books these days. Although I wouldn’t say no to personalized glasses either. I adore the watch so much! So damn pretty. Hehe books are the best, so exciting when you receive one you can really sink your teeth into! Aww I’m so glad 😊 no problem! 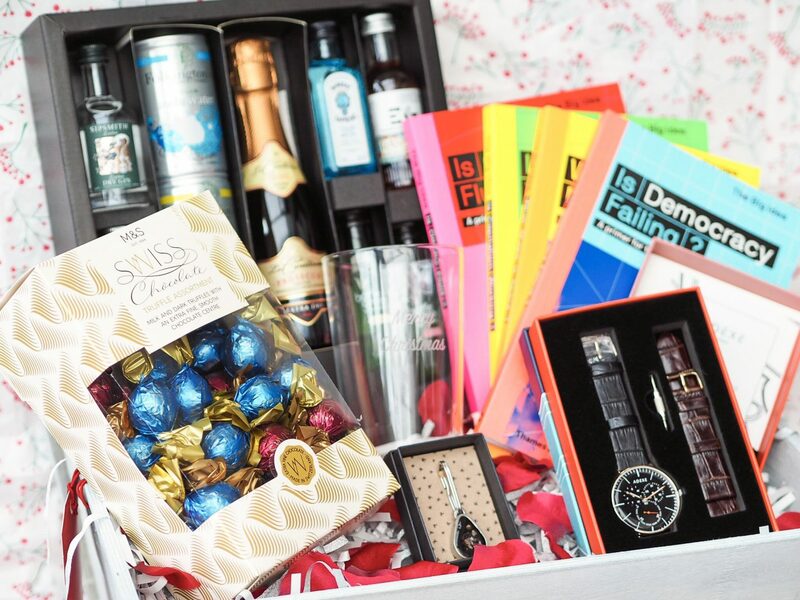 I’m loving these hamper gift guides! I’d love a new watch and a camera as my luxury item (I know I’ve got a camera 🤗🤗).